hand and you can type as you savor every bite. in your hand and melting all over the keyboard. Oh how I do love to tempt fate. In my hand is the very simple Edy's Grape Fruit bar, and when you keep things simple, it's hard to mess it up. I don't need preservatives in my popsicles, nor do I need high fructose corn syrup and 7 different dyes. 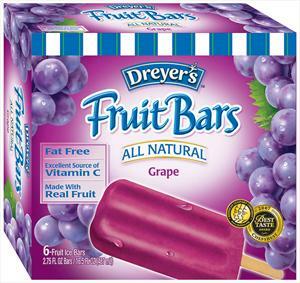 I just want a plain old popsicle and this grape one is hitting the spot. ...and now it's gone, that was quick! at least the keyboard is still clean, think I'll just give myself a little pat on the back for that. Oh geez, I almost forgot. In a unique marketing strategy, Edy's use to send you a coupon for a free box of Fruit Bars if you have had (or will have) a tonsillectomy if you are under 18 years of age.